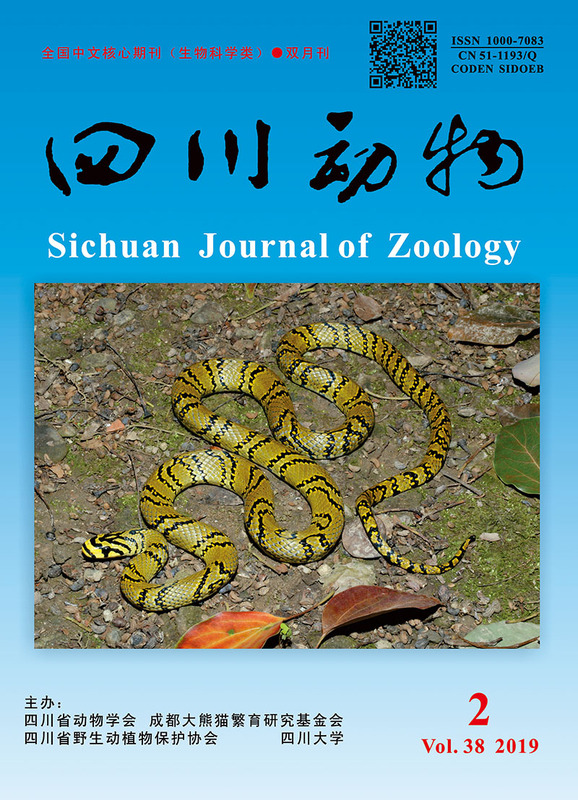 Abstract：In this study, the quantity and distribution of genome-wide microsatellites in the Chinese monal (Lophophorus lhuysii) were analyzed, and the coding genes containing microsatellites were annotated. The results showed that in the whole genome of L. lhuysii (1.01 Gb), there were 29·2 430 perfect microsatellite sequences of bases 1-6 with a total length of 5 465 549 bp and relative abundance of 290.47 loci/Mb, accounting for 0.54% of the whole genome sequence. The microsatellite sequence length was mainly between 10-43 bp. Among the different types of microsatellites, mononucleotide microsatellites (3 535 260 bp, 71.75%) were the most abundant simple sequence repeats (SSRs), and the lengths of other types of microsatellites were much smaller than the mononucleotide type. The other microsatellites were tetranucleotide (611 568 bp, 9.99%), dinucleotide (376 944 bp, 7.07%), trinucleotide (335 742 bp, 6.38%), pentanucleotide (500 615 bp, 3.93%) and hexanucleotide (105 420 bp, 0.88%). The top 10 dominant microsatellites in L. lhuysii genome were A, C, AAAC, AT, AAAT, AC, AAT, AAC, AG and AAAAC, accounting for 90.20% of the SSRs and showing an obvious A bias. The number of microsatellites located on the exon region was 2 816, and was significantly less than that on the 101 791 non-coding sequences and 187 823 intergenic regions. The genes (n=1 314) in which the microsatellites were distributed in the exon region were annotated. GO annotation analysis showed that these genes were mainly related to cellular components and the top 10 enriched terms were predominantly related to metabolism, synthesis process and transcription. The most enriched KEGG pathway was related to adherens junction. The microsatellites in the exon likely cause genetic mutations. The microsatellites distributed in the exon region were found to be associated with environmental information processing, cellular basic component and metabolism. Any mutations in this location might affect the ability of L. lhuysii to adapt to environmental stimulation and fluctuations. This study provides basic data for the further study of microsatellite and genetic diversity in L. lhuysii, and provides useful information for the protection of L. lhuysii. 何芬奇, 卢汰春. 1985. 绿尾虹雉的冬季生态研究[J]. 动物学研究, 12(4):523-527. 黄杰, 杜联明, 李玉芝, 等. 2012. 红原鸡全基因组中微卫星分布规律研究[J]. 四川动物, 31(3):358-363. 黄杰, 原宝东, 杨承忠. 2017. 虎皮鹦鹉全基因组中微卫星分布规律研究[J]. 野生动物学报, 38(3):422-426. 李午佼, 杜联明, 黄杰, 等. 2012. 珍珠鸟、火鸡和红原鸡基因组微卫星比较分析[C]. 成都:首届中国西部动物学学术研讨会. 刘梦瑶, 高依敏, 陈建宁, 等. 2013. 绿尾虹雉保护生物学研究现状[J]. 江西林业科技, (2):36-39. 卢汰春, 刘如笋, 何芬奇, 等. 1986. 绿尾虹雉生态学研究[J]. 动物学报, (3):76-82, 109. 卢婷, 王晨, 杜超, 等. 2017. 林麝全基因组微卫星分布规律研究[J]. 四川动物, 36(4):420-424. 张云武, 张亚平, Oliver AR, 等. 2001. 微卫星及其应用[J]. 动物学研究, 22(4):315-320. 周天华, 丁家玺, 田伟, 等. 2017. 天麻基因组微卫星特征分析与分子标记开发[J]. 西北植物学报, 37(9):1728-1735. Beckman JS, Weber JL. 1992. Survey of human and rat microsatellites[J]. Genomics, 12(4):627-631. Bennett P. 2000. Demystified … microsatellites[J]. Molecular Pathology, 53(4):177-183. Bird AP. 1986. CpG-rich islands and the function of DNA methylation[J]. Nature, 321(6067):209. BirdLife International. 2016. The IUCN red list of threatened species[EB/OL].[2017-03-15]. http://dx.doi.org/10.2305/IUCN.UK.2016-3.RLTS.T22-679192A92806697.en. Conesa A, Götz S, Garcíagómez JM, et al. 2005. Blast2GO:a universal tool for annotation, visualization and analysis in functional genomics research[J]. Bioinformatics, 21(18):3674-3676. Du L, Zhang C, Liu Q, et al. 2017. Krait:an ultrafast tool for genome-wide survey of microsatellites and primer design[J]. Bioinformatics, 34(4):681-683. Gallie DR. 1991. The cap and poly(A) tail function synergistically to regulate mRNA translational efficiency[J]. Genes Development, 5(11):2108-2116. Gupta PK, Balyan HS, Sharma PC, et al. 1996. Microsatellites in plants:a new class of molecular markers[J]. Currentence, 70(1):45-54. Jia Y, Lin F, Zheng H, et al. 2006. WEGO:a web tool for plotting GO annotations[J]. Nucleic Acids Research, 34:293-297. Koning APJD, Gu W, Castoe TA, et al. 2011. Repetitive elements may comprise over two-thirds of the human genome[J]. PLoS Genetics, 7(12):e1002384. DOI:10.1371/journal.pgen.1002384. Levinson G, Gutman GA. 1987. Slipped-strand mispairing:a major mechanism for DNA sequence evolution[J]. Molecular Biology & Evolution, 4(3):203-221. Ma H, Yue Y, Liu Y. 2004. Microsatellite DNA molecular marker and its application in animal breeding and genetics[J]. Journal of Animal Science & Veterinary Medicine, 23(5):16-19. Pérez MA, Gallego FJ, Martínez I, et al. 2001. Detection, distribution and selection of microsatellites in the genome of the yeast Saccharomyces cerevisiae as molecular markers[J]. Letters in Applied Microbiology, 33(6):461-466. Subramanian S, Mishra RK, Singh L. 2003. Genome-wide analysis of microsatellite repeats in humans:their abundance and density in specific genomic regions[J]. Genome Biology, 4(2):1-10. Xie C, Mao X, Huang J, et al. 2011. KOBAS 2.0:a web server for annotation and identification of enriched pathways and diseases[J]. Nucleic Acids Research, 39(Web Server issue):W316-W322.